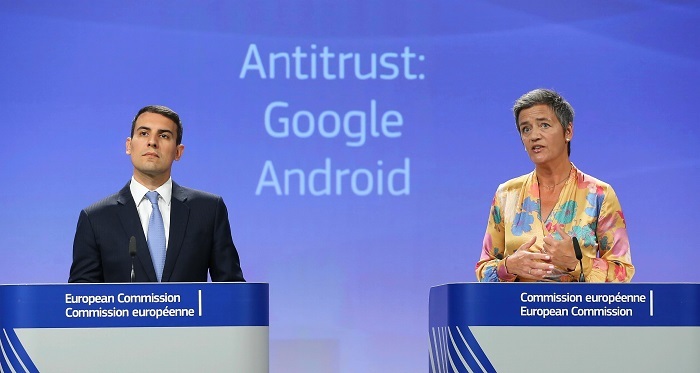 European Union regulators fined Google with a record-breaking $5 billion fine for Android anti-competitive practices. Google has been accused of abusing its Android market dominance after being closely investigated by the European Commission over the past year. The first complaint filed against Google for using its market dominance unfairly against competitors was initiated by FairSearch in 2013. Included rivals making the complaint at that time were Nokia, Microsoft, and Oracle. The European Commission says that Google has acted illegally in three specific areas. First, it required that Android and tablet manufacturers pre-install Google Search and Google Chrome if they wanted to be able to offer access to the Play app store. It also prevented these manufacturers from selling smart devices powered by alternative versions of Android. Finally, they paid large manufacturers and mobile network operates that would exclusively pre-install the Google Search app on their devices. Google has been given 90 days to change their practices or they could face further financial fines. They plan to appeal, as device owners could still download other web browsers and use alternative search engines. Nevertheless, Competition Commissioner Margrethe Vestager noted that only 1% of users downloaded a different search app. Only 10% of users were found to opt for a different browser. Google had previously been fined a $2.7 billion record-breaking fine by the EU just a year ago for manipulating search results. Google is also appealing that judgment, a process that will likely take years. A trade body representing mobile operators has said regarding the issued fine, "This will enable consumers to benefit from a greater choice of mobile services, and allow more players to innovate and offer new services in the market."